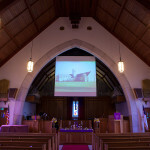 The modern House of Worship offers a message enhanced with audio visual and other equipment to inspire, encourage fellowship, and increase comfort. Draper offers many solutions to help you enhance your message and your facility, as well as help you become a place of community. Draper Solutions for Houses of Worship is dedicated to helping you find the right solution for your application.